In the summer of 2007 I studied in Beijing, China. It was the first time I had been abroad and traveled without the parents. As a result, I had a wonderful time pushing the envelope and striking up conversations with people. When I returned to Chicago, I was determined to refresh my new found adventurous spirit. The first thing I did was to start exploring Chicago’s diverse ethnic neighborhoods and restaurants. 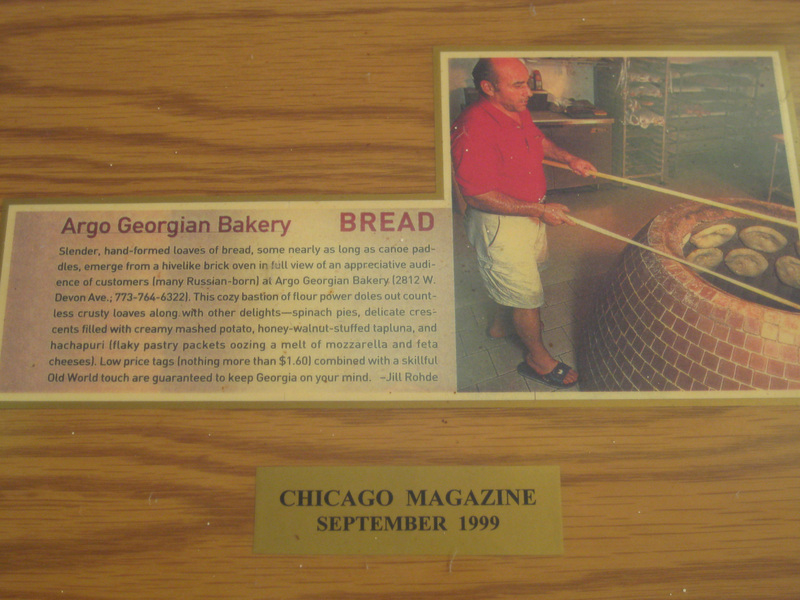 Argo Georgian Bakery. It’s the sort of place you can fly right past as you walk along Devon Avenue in West Rogers Park. For me, it was the warm, enveloping smell of something that had just been taken fresh out of the oven that made me stop. When I walked in, I was immediately struck by the massive beehive-shaped oven, which takes up a good half of the space. Since I had never been to a Georgian bakery, much less seen an oven like that, I proceeded to pepper the man working the counter with all of my ignorant American questions. Alex Manushavich turned out to be the owner and, anticipating that it would take awhile to feed my curiosity, he motioned for us to sit in the modest dining area that consisted of two small tables. 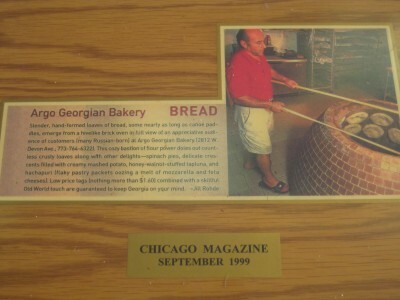 Argo is the only bakery of its kind in Chicago. The tandoor hearth oven is specially made to bake Tonis Puri, the Georgian bread staple, and gets up to 500 degrees. There are two kinds of Tonis Puri Manushavich makes: flat and round. The flat Tonis Puri takes 5-6 minutes to bake while the round takes 8-10 minutes. The dough is baked stuck to the side, like Indian naan. The baker must be attentive. If it has not baked long enough, it will remain stuck; if it bakes for too long, it will fall down between the racks. Only three ingredients go in: flour, salt and water. When I asked for a recommendation, he pointed me in the direction of his fresh-baked Khachapuri–the source of the smell that had lured me in the first place. Khachapuri is a gooey cheese-stuffed round pie of feta, mozzarella and goat cheese. For my sweet tooth, he pointed me to a flaky pastry with farmer cheese and raisins. As I think about it, food has always been the bait for my introduction to new and different cultures–even my own. Like every other kid, my parents dragged my brother and me to summer camp, except ours was a “culture” camp for Korean adoptees. We learned songs in Korean and how to count to ten, but my favorite part was making Korean dumplings. You could always tell which dumplings the camp counselors made and which were made by the kids, but both tasted just as good. My mother has always made a conscious effort to incorporate Asian cuisine into her big book of American recipes and one day I will inherit this. I walked out of the Georgian bakery with my hunger satisfied and my curiosity piqued for an ever-growing list of places Iâ€™ll be exploring one day. it’s a very helpful website.